UDM Downloads > Magic Music Studio Pro! 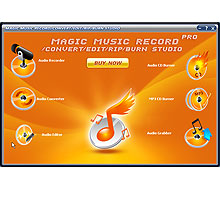 Not only can you use Magic Music Record Convert Edit Rip Burn Studio Pro to grab music from a CD, but also record audios, in virtually any format. Stop there, and burn your improved, converted audio files to disc. Or use the advanced audio editor to create your own music and songs that you can transfer to CDs, or share it with your friends in party. With Magic Music Record Convert Edit Rip Burn Studio Pro you can: Digitize a sound recording to the hard disk, in a way that is suitable to record it on an audio CD; Record audio data from a microphone or other available input device ; Display a waveform window of an audio file and apply zooming; Edit audio files visually and apply various effects as well as different filters to any selected portion of audio files; Convert an audio file from one format to another; Digitize a sound burning to the hard disk, in a way that is suitable to burn it on an audio CD. You could enjoy all the features in the trial period. So, just download it and try!